What’s the Deal with All These Potholes? This past weekend I traveled out of town to visit some family and friends. What was otherwise a pleasant commute on a clear, sunny day soon became nuisance as I steered around a bunch of pesky potholes. It felt like I was driving through an obstacle course at times, carefully avoiding all those small divots in the roadway. All the while, I couldn’t help but think: Why doesn’t someone do something about all these darn potholes? These roads have been a mess for a while. What’s taking so long to fix them? There are many reasons that potholes form in the road. One such reason occurs when sunlight, heat, and constant traffic create cracks in the asphalt road surface. This allows rainwater and snow to seep through the cracks into the gravel underneath the asphalt. When temperatures drop, such as they do in the evenings, the water freezes, expanding and pushing back dirt and debris. Then, when the water melts, it creates gaps underneath the asphalt. As vehicles continue to drive over these gaps, the covering asphalt eventually collapses and creates a pothole. The best way to handle a pothole is to avoid it if you are safely able to do so. Unfortunately, as I experienced this past weekend, that is not always possible. So what do you do when you can’t maneuver around those vexing road craters? Is it better to drive over them even though you’ll probably experience a rocky ride? Or is it best to turn around and find a detour? There really isn’t any standard correct answer; it depends on the situation at hand. However, there are some general tips that can help you decide the best approach to take when you encounter a pothole in the road. But first, let’s take a look at what risks potholes present to us drivers. Potholes present a huge threat to drivers on the road and are considered one of the top causes for car accidents! When driving over potholes, your vehicle bumps and jerks uncontrollably. This can cause drivers to lose control of their vehicles and get into an accident. 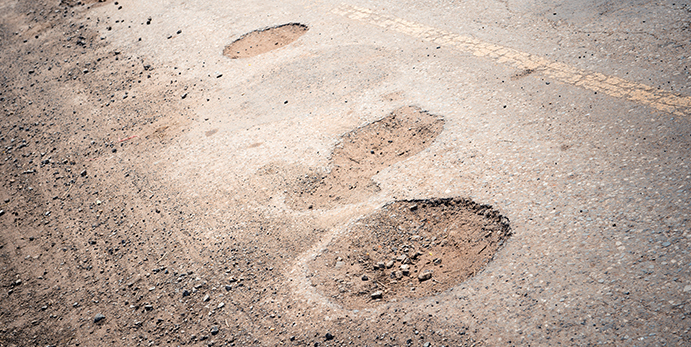 Driving over potholes also strains your vehicle’s suspension and shocks which absorb most of that sudden impact. Enough strain can ruin your suspension system, shocks, tires, and knock your car out of alignment. Water and snow can fill potholes, masking potential hazards lying underneath. Additionally, water and snow can cause more damage to your vehicle. If you have to drive over a pothole, slow down beforehand. Reducing speed will decrease the potential shock and damage caused by the bumpiness. Also, do not brake directly over the pothole as this can actually cause more damage. While driving over a pothole, hold your steering wheel securely with two hands and keep your wheels straight ahead. Leave plenty of room between you and other vehicles and pedestrians. Prepare ahead of time by making sure your tires are properly inflated. This can help protect your tires from damage, as well as reduce some of the jarring impact. Be especially wary if a pothole is filled with snow or water. You never know just how deep it is or if there are other hazards underneath. If you can’t avoid a pothole, and you think it’s best not to drive directly over it, your best bet would be to turn around and find a detour. It’s better to retreat and drive a bit further than to have your car broken down on the side of the road. Trust me! If you don’t report troublesome or hazardous potholes, how can you expect it to be fixed. Don’t rely on someone else to report the problem; contact your local government’s transportation department and help fix your city streets. Every city will have their own policy for repairing the roads. They might not have a 24-hour timeline like Santa Rosa does, but one thing is certain: if you don’t report the problem, you can’t expect it to get better. Do your part: report those potholes! Once reported, how exactly do workers fix these potholes? There are two categories for pothole repair: temporary repair and semi-permanent repair. Temporary repair is a quick solution to potholes, but, as the name suggests, doesn’t last as long as the other option. This type of repair is often called the “throw-and-roll” repair. It generally uses a cold mix asphalt patching compound to fill the pothole. This cold mix is faster than using hot asphalt because it quickly hardens into a strong asphalt patch. This can be done year-round since it doesn’t require any heating or special rolling machines, as opposed to more permanent repair types that generally do. This temporary fix is a quick year-round option for cities and residence to patch potholes, but it might not be as long-lasting as other options because it’s basically just applying a patch to a hole instead of actually repairing any of the actual road damage. Remove all water and debris from the pothole. Use a saw to cut along the sides of the patch area to ensure that the sides of the patch are in sound pavement. Apply a hot or cold patch mix to the patch area. Use a compacting device to roll over the patch area, sealing and securing it. Remove all debris and water from pothole. Use spray-injection device to apply tack coat of binder on the bottom and sides of the pothole. Workers blow asphalt and aggregate into the pothole and cover the patch area with a final layer of aggregate for sealing. Each of these options can vary in time and equipment required for completion. Options like the “throw-and-roll” repair might take longer than other options because it requires actual manpower, but it doesn’t require any special equipment or weather conditions, making it a viable option in practically any situation. Other options can be done much faster--the spray injection repair can be completed in as little as one minute--but they require special equipment to complete which can delay the overall repair time while parts are being ordered or transported. There is no perfect solution to potholes. Fortunately, there are multiple options that work in many different situations and environments. Potholes are annoying and can be dangerous, but now you know the best way to handle them. You also have a better idea of the process worker go through to repair potholes, as well as your responsibility as a driver to report those potholes when you see them. So when you see a pothole, don’t just avoid and forget it, leaving it for another driver to deal with. Report it and be part of the solution. That’s the best option for everyone!